Working your job should not hinder you from living a healthy lifestyle. Unfortunately, some jobs are simply more sedentary by nature, and this can have a negative effect on the health of employees. While some workers can offset some of these negative effects by getting in an uninterrupted workout before or after work, that isn’t always possible. Maybe you always work long hours, and a late night gym session is the last thing on your mind after a hectic day at the office. Or perhaps your job requires you to work extra long hours during certain periods, like the end of a sale cycle or during a particular project, leaving no time for a session at the gym. Whatever the reason, the reality remains that sitting for long periods of time is unhealthy. Studies link long periods of unbroken sitting with an increased risk for diabetes, cardiovascular disease and even death. In fact, the effects of working a sedentary job on mortality have been equated with those of smoking. Even those workers who do get in a workout before or after work need to be able to break up long spells of sitting during the day to remain healthy. 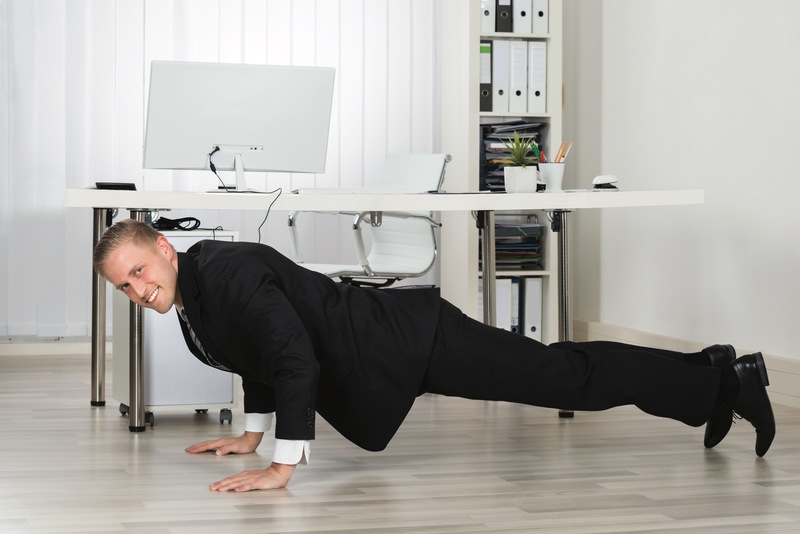 Do 10 minutes of bodyweight exercises during breaks. Some ideas are push-ups, sit-ups, lunges, jumping jacks and bodyweight squats. Of course, these movements are easier to do if you have your own office and can shut the door. If you are in a cubicle or have an open floor plan, you might be self-conscious doing these types of exercises. If this is the case, you can simply go for a brisk walk around the office, or walk up a few flights of stairs. These alternatives will still elevate your heart rate and get your muscles moving, which is much better than uninterrupted sitting time. Park far away from your building, and take the stairs to your floor. It might seem insignificant, but this extra movement is great for your body. Over the long run, this additional cardiovascular activity has a compound effect that can really make a difference to your health. Two minutes of stair climbing burns about 21 calories for someone who weighs 175 pounds. If you are doing that at least twice a day, that is an extra 210 calories burned that week—just from taking the stairs instead of the elevator. If you work 50 weeks out of the year, that is 10,500 calories burned. Get a lunch break workout in. This might be something you will have to run by your boss for approval, but it is well worth having the conversation. Getting in a 30- to 45-minute walk, run or workout at a nearby gym in the middle of the workday is not only great for your health, but it can also have a positive effect on your job performance. Studies are now showing that exercise during work hours can improve work performance. In one study conducted by Leeds Beckett University, employees who visited the gym during the workday reported managing time more effectively, being more productive and having better interactions with their colleagues. This makes sense, considering regular exercise is shown to improve mood, concentration and memory, as well as reduce stress and enhance creativity. Collaborate face-to-face. Email, team communication apps and phones have all made it easy to communicate with your coworkers without ever having to leave your desk. While this is certainly convenient, this technology has also lured office workers into being even more sedentary. Instead of picking up the phone or typing out an email every time you need to collaborate, consider taking a stroll down to your coworker’s office to chat. Switch up your workstation. Swap your office chair for an exercise ball, which requires you to sit up straight and engage your core while you are working, or opt for an adjustable desk. Making these small changes throughout the day can have a profound effect on your overall health over the long run. If you have worked in a sedentary way for a long time, it can take a while to adjust to a more active way of working. Slowly incorporate one healthy behavior at a time into your routine, and eventually they will become habits you won’t want to live without. Standing Desk: A standing desk is an excellent way to break up your sitting stints throughout the day. An adjustable desk is the best option, as standing the entire workday is not actually recommended. Experts suggest you should be standing up every 20–30 minutes. Balance Stool: These go by a variety of names, such as wobble stools or active sitting chairs. These stools are great for working on balance and core strength while at your desk. 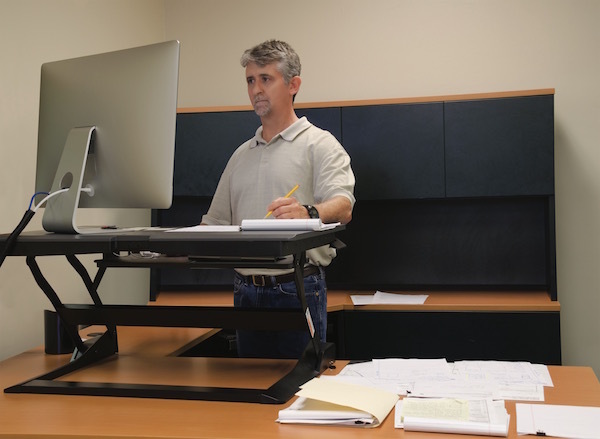 They are also an excellent addition to a standing desk when you need to take a break to sit, perch or swivel, as they are height-adjustable and can be positioned several different ways. Balance Board: Similar to a balance stool, a balance board is a great accessory for a standing desk. These boards allow you to comfortably shift your weight while you are working standing up. Under-Desk Stationary Bike: Pedal with low resistance throughout the day for light exercise, or bump up the resistance and pedal faster for a more intense workout. Treadmill Desk: The treadmill desk is a pricier option, but it is a worthwhile investment for those workers who can’t seem to get away from their desks throughout the day.